Q1: As a well respected person in Health Informatics, can you give us an example where you championed strategic enterprise architectural thinking to positively impact a local health organization’s operations (in whatever field they may be)? Ans: Yes, in two instances. First, when I was CIO at PhilHealth (scope of enterprise = PhilHealth), we came up with PhilHealth Enterprise Architecture version 1.5 as a way to visualize the scope and extent of IT in the corporation and how it can be strategically reformed to meet its new business requirements (eg, eClaims). This was an important activity as it organized the many different applications (and business mindsets) into unifying framework and aligned them to the core business of the Corporation (that is, universal health coverage and financial risk protection). Prior to this, there was only an information systems strategic plan (ISSP) which was more tactical than strategic. Second, in the Philippine eHealth Strategic Framework and Plan (scope of enterprise = national health sector), there is an effort to use EA methodology in defining the business architecture and from there, the data/application and technology architectures. This is easier said than done due to the complexity of the stakeholders relationships and our relative naivete with IT governance at national scale. You can also apply EA in your next project. If you are implementing a health IT project in a clinic or hospital, the systems analysis part of your work will be easier if you apply EA principles (looking at the enterprise continuum and searching of existing artifacts/solutions). Q: What are their current business demands and evolving IT needs? Ans: In terms of business demand, the Steering Committee wishes to see the following benefits from eHealth – decrease maternal deaths, increase universal health coverage, and completion of the health facility enhancement program. IT will always evolve due to the rapid changes in technology but the business demands will not change that fast. The key is to ensure that the business demands are being met while IT changes are managed. Not all new IT features are desirable especially if it will disrupt operations. This is why an EA method is important in deciding which of the new changes can be adopted and which ones can wait. Q: Any updates as of this day of the organization’s current status? Ans: I can’t speak for PhilHealth now but for the PeHSFP, there is a top-level business architecture that will be sharable in the public hearings on Oct 20-21. Q: With the scarce resources, how did you finally decide on which to take on first and what led to this decision? Ans: That decision is made by the most accountable entity (the National eHealth Steering Committee) with information/advice from the Technical Working Group. Major decisions on funding and directions are always made by the highest governing authority. And since the Steering Committee set its priorities (decrease maternal mortality, increase universal health coverage, complete the health facility enhancement program) it clarifies the priority activities that will require support and funding. Q: Since we are aiming for a unification operating model, what areas/processes in the eHealth strategy would you classify as belonging to high level integration and which would be classified for standardization? 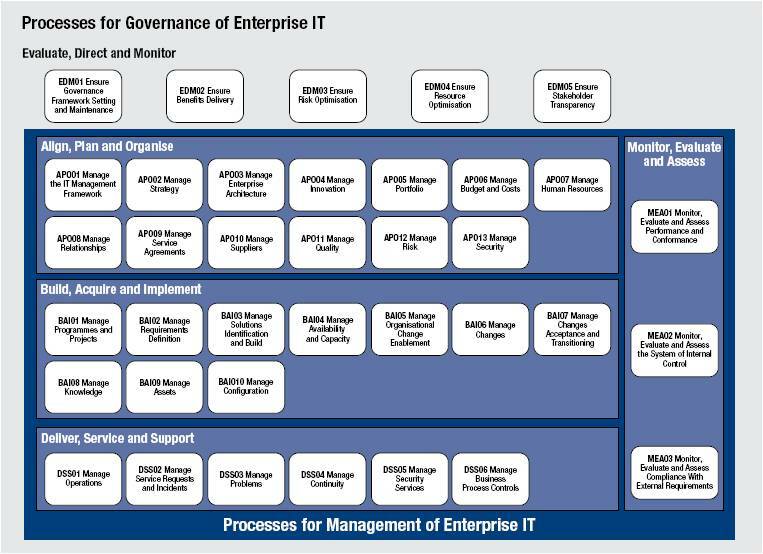 COBIT5 EDM processes (evaluate, direct, monitor) and APOs (align, plan, and organize) are high-level. When you get down to BAI (build, acquire, implement), you may want to use EA methodology to determine (and weigh in on the) opportunities and solutions. Definitely there should be standardization at the data layer (semantic and synctactic) but we don’t need to reinvent the wheel. A review of existing standards and matching them to our business needs can help with deciding which ones are appropriate to the country (enterprise continuum). This goes for the national eHealth strategy but the same delineation can be used within a clinic. They key is enterprise continuum — being aware of artifacts that are already out there and leveraging them (rather than reinventing). Q: What principles of Service Oriented Architecture are being referenced to by PeHSFP? At the outset, just Standardized Service Contract (http://serviceorientation.com/static/pdf/SOA_Principles_Poster.pdf). But the rest of the principles need to be addressed systematically. The adoption of enterprise service buses will help with complying with some of these principles. Q: Is there such a thing as a turnaround time to get things done? Or is it an iterative process? Ans: They’re the same actually. One iteration is one turnaround time. It is the definition of “done” that determines if the iteration was successful. A clear product vision helps in determining whether the iteration was able to achieve its objective. This was written by admin. Posted on Sunday, October 5, 2014, at 6:15 pm. Filed under Enterprise Architecture. Bookmark the permalink. Follow comments here with the RSS feed. Post a comment or leave a trackback.